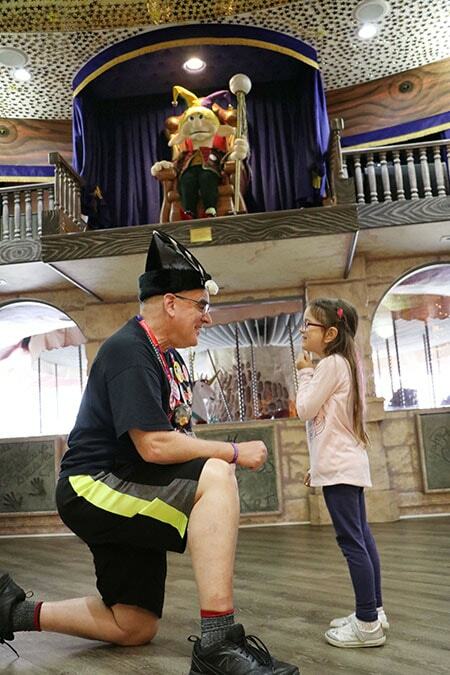 An aging court jester is performing new tricks for kids who need a laugh, thanks to students at Carnegie Mellon University’s Entertainment Technology Center. At Give Kids the World, a nonprofit Florida resort for children with life-threatening illnesses, Tom Foolery was a puppet who held court in the resort’s Castle of Miracles. Operating the puppet required a dangerous climb to the castle’s perch. Today, he’s an animatronic figure that can be operated safely from the ground with the push of a button. “It’s been very rewarding to work on something that will literally touch the lives of so many children and families in such an exciting place,” said Dustin Stephan, a second-year ETC student who lead the team as its producer and creator. Stephan’s teammates included ETC students Raisa Chowdhury, Josh Danzig, Alex Gobeler, Atul Goel, Rajat Gupta and Niharika Jain. Stephan, who helped install the puppet this fall, and the ETC team worked closely with Give Kids the World as they redesigned Tom Foolery’s mechanics, scripted and recorded show content where Tom tells joke and sings, and programmed that into a touch screen monitor for volunteers to use. With the new content, Tom will perform at dance parties, interact with volunteers reading books to children during the castle’s story-time programs, and help sing the castle to sleep as part of an evening program. The students also created documentation to show how volunteers can do repairs to Tom Foolery. ETC students have been working with the nonprofit for more than a decade. Students provide much-needed changes or innovations to the resort, and in return, they gain hands-on experience with real-world projects in the entertainment industry. ETC Associate Teaching Professor Brenda Bakker Harger said ETC students who have collaborated on Give Kids the World projects have gone on to work at Disney, Facebook, Google and Universal Creative. The partnership is personal for Harger, whose daughter Hallie battled leukemia in 1990. When Hallie, now 29, entered the maintenance stage of her treatment three years after diagnosis, Harger’s family stayed at Give Kids the World through a Make-A-Wish Foundation gift. Harger never forgot that vacation and the break it gave the family from hospital visits, saline drips and monitoring white blood cell counts. When Harger saw Give Kids the World representatives at a trade show years later, she offered the ETC’s help. Many of the Castle of Miracles updates have been made with the help of the ETC, said Abby Kracoff, entertainment director for Give Kids The World. In addition to Tom Foolery, ETC students have worked on characters like Father Time, a clock that sings the castle to sleep each night, and a magical tree that makes pillows for the children. Students also created a mapping tool for the gold stars decorated by Make-A-Wish children that line the castle’s ceiling and a nearby tower. These tech-savvy projects would be cost prohibitive for the nonprofit if it wasn’t for the ETC, Kracoff said. Gobeler, the project’s mechanical designer and a second-year ETC student, worked with ETC alumni Tim Eck (02) and Andy Hosmer (06) on the redesign. Gobeler used her mechanical engineering background to design Tom Foolery with a CAD program. Gobeler said her mentors’ guidance was invaluable to her experience and the project’s success. The project also fit perfectly with Gobeler’s future goals of working as an animatronic designer in the entertainment industry. After coming to the ETC with 25 years of experience in entertainment, Stephan said his work leading the interdisciplinary team provided him with new tools for success. While Gobeler spent the last summer at a Disney co-op, Stephan interned at Give Kids the World, where he worked with volunteers and other interns to playtest Tom Foolery’s operator console and system to sync the character’s movements and dialogue.